Map identifying the Solomanic treasure cities Ophir and Tarshish. El Puerto de Ophir. Ila Antigua Derrota de Tarsis. 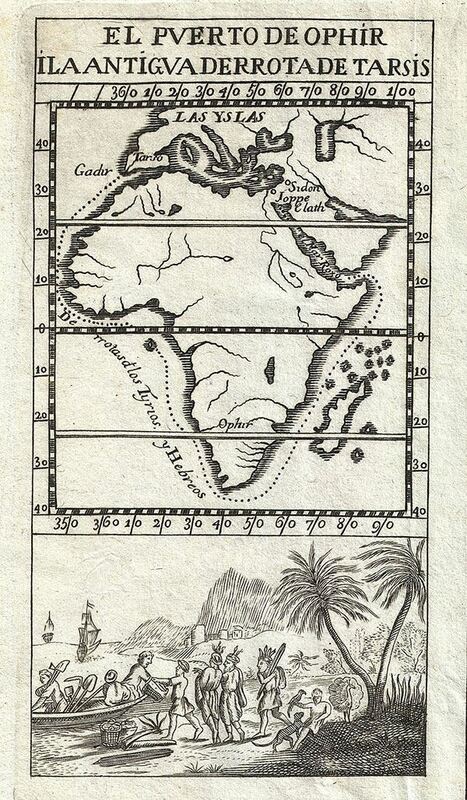 This is a fine 1754 map of Africa by Gabriel Ramirez. It covers the entire continent of Africa with adjacent parts of Europe and Arabia. The map identifies the biblical port of Ophir. Associated with the legends of King Solomon, Ophier was said to be a kingdom of limitless wealth form which Solomon collected the gold need to construct the First Temple of Jerusalem. The true location of Ophir is a matter of significant debate among biblical scholars and archeologists, Africa, Ceylon, and Malay all being viable options. From the 16th century on, most, as per this map, believed Ophir to be located either in or around the African Kingdom of Monomotapa. This gold rich kingdom includes parts of modern day Mozambique and Zimbabwe. The map also identifies Tarshish or Tartessos in Southern Spain (here identified as Tarso), another kingdom from biblical legend, from which Solomon was believed to have acquired ivory and other valuables, and also from which he initiated his mission to Ophir. A beautiful illustration of natives loading boats with shovels and other tools is included at the bottom of the map. This map was originally prepared in French by Abbot M. Pluche and translated into Castilian Spanish for publication in Volume VII, Part 4 of D. Gabriel Ramirez's Espectaculo de la Naturaleza, O Conversaciones a Cerca de Las Particularidades de la Historia Natural. Very good. Minor wear along original fold lines. Original platemarks visible. Minor spotting near lower left border. Blank on verso.